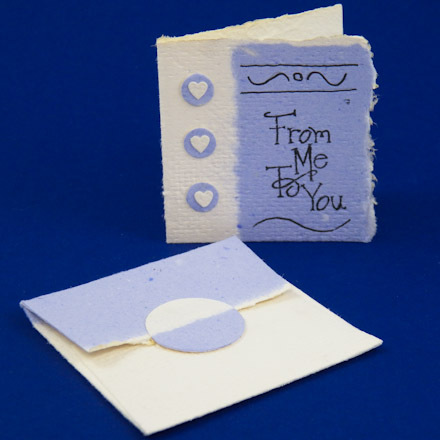 This project goes beyond the techniques introduced in Handmade Paper from Recycled Scraps and shows you how to use paper plying to create decorative effects on your handmade paper. Paper plying is the technique of making paper with two or more layers. 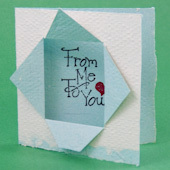 The resulting two-sided paper can be used in all of your paper crafts. 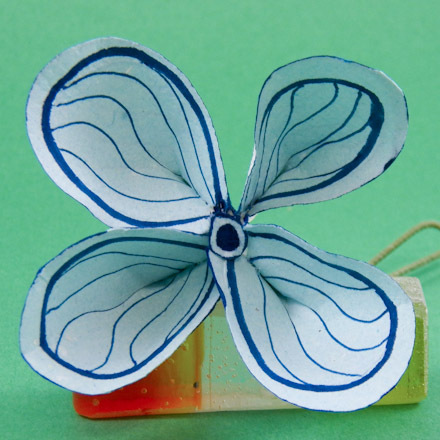 You can even create paper sculptures by making 2-ply paper with embedded wire. Before you start making paper, you will need to prepare your equipment and work area. Review the list above, and make sure you have everything needed to make paper. Follow the instructions in Handmade Paper from Recycled Scraps for setup and paper/pulp preparation. To make 2-ply paper, mix pulp slurries in two tubs—one tub with white and the other tub with another color. 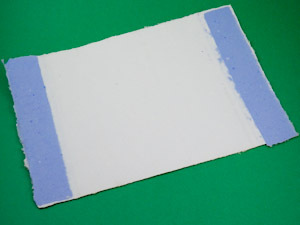 Tip: If you have some dark scraps of paper, just a few pieces need to be added to a white slurry to make a nice pastel. A 2-ply sheet of paper with different colored sides is easy to make. First make and couch a base sheet in white, then make a sheet in another color and couch on top of the base sheet. Follow the instructions in Handmade Paper from Recycled Scraps for making paper, couching sheets, and drying. Plying can be used to make a sheet of paper with a top, side or bottom border in a different color. First make and couch a base sheet in white. Dip part of the mold into another color—just 1" or 2" (2 to 4 cm) of the top or side or maybe a corner. Couch on top of the base sheet. Follow the instructions in Handmade Paper from Recycled Scraps for making paper, couching sheets, and drying. 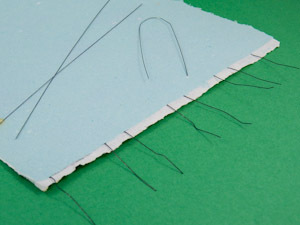 Embedding a wire between two paper plies facilitates paper sculpting. Take four or five 6" to 8" (15 to 20 cm) pieces of light gauge wire and bend them into flower petal shapes. Press the wire loops with a heavy book so that they are flat. Make and couch a base sheet of paper. Lay the wires on the base sheet with the ends extending beyond the edge of the sheet. Leave at least ¼" (.5 cm) between the wires. Couch another sheet on top of the wires and base sheet. Follow the instructions in Handmade Paper from Recycled Scraps for making paper, couching sheets, and drying. After the paper is dry, cut out the individual petals. Shape the petals and join them together with another wire to make a flower. The possibilities with this technique are limitless! That's it! 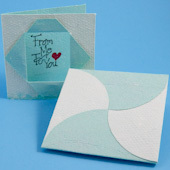 Now experiment some more with paper plying! 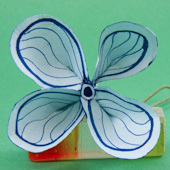 Tip: Three-dimensional flowers and paper sculptures are easy to create from 2-ply paper with embedded wire. 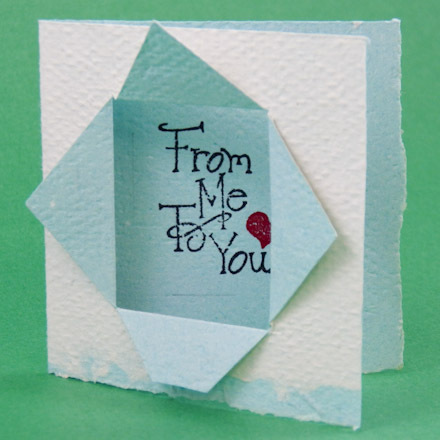 Tip: Make a Double-sided Paper Window Card using 2-ply handmade paper. See the tip in the tutorial for making a peephole card. This printable pattern includes envelope templates for gift enclosure cards in three sizes: 2¼", 2½" and 2¾". See the Mini-Envelope Pattern webpage for more details on making the card and envelope. Tip: Make gift enclosure cards and matching envelopes from handmade paper with a contrasting border, and beautiful Square Petal Envelopes are an excellent use of 2-ply paper.